Developed various SSRS reports related to sales and marketing. Upgrading to latest version of Magento. 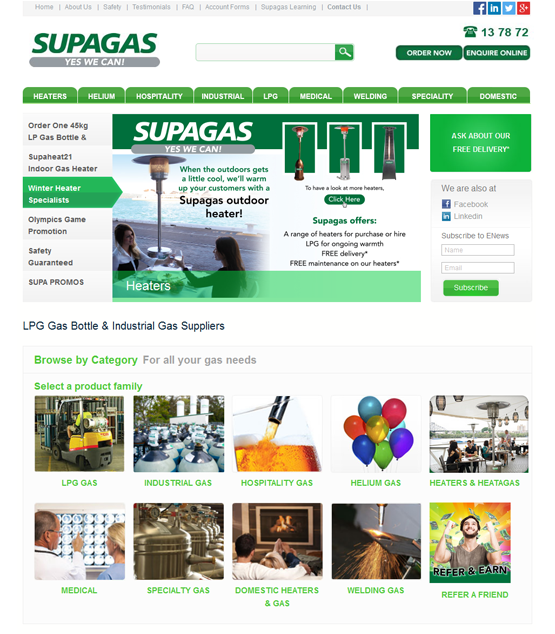 Home Page with Order Now Form and links to other services like placing an Enquiry, Customer Portal login and other trivial information regarding Supagas's products undre various categories. Product Catgeory and Product Details Page with Order now and Compare Products functionality. Domestic customer and Commercial Account application form and its submission. Contact Us page with Supagas branches and Supa SWAP locations. Detailed Enuire Online form and its submission. Few other pages like About Us, FAQ, MSDS Safety and Testimonials page. Apart from the above functionality for searching supa gas locations by postcode as well as displaying of offers / promotions by products.